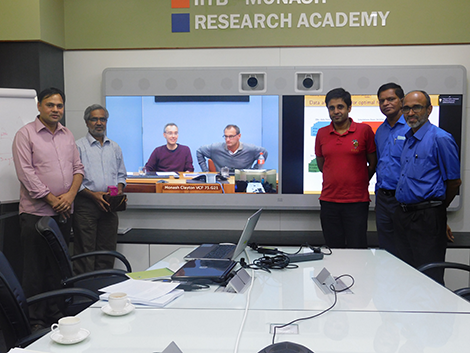 Kamal Murari, jointly guided by Prof. Subimal Ghosh (IIT Bombay) and Prof. Edoardo Daly (Monash University), defended his thesis on ‘An assessment of climate variability and climate change on heat wave characteristics in India’ on 25 November 2016. He tried to understand the mechanisms responsible for the occurrence of heat waves in India. He combined the climate models with statistical techniques for more accurate characterization of climate extremes and improving projections by comprehensive assessment of uncertainties. He perceived the knowledge gaps in establishing plausible links between climate variations, climate change and the climate extremes. He found that a large amount of work needs to be done to generate predictive insights which would address the gaps. It was inferred that statistical methods and data mining tools would be more effective in monitoring and understanding localized climate patterns, especially extremes. To be fully effective, availability of extensive and exhaustive data was of paramount importance. The work is calibrated towards the ground realities like demographics, topography and infrastructure. His research aims to provide the general public, policy makers and planners with the kind of effectual information which would enable them to understand and deal with the heat extremes as a natural disaster. Kamal said that the results from his research point to the need of the hour for extensive research on the adverse effects of the heat waves of the future. He emphasized that policies need to be formulated to cope with the negative impact of the heat waves on the population. Kamal Murari had pursued his research in the Academy as a part-time student. He is a faculty in Tata Institute of Social Sciences, Mumbai. Wishing you all the best for a successful career after getting a PhD, Kamal!